October 13, 2015 By This post may contain affiliate links. Can you handle eating creepy Halloween treats? What if they are lusciously creamy, sweet and chewy Black Caramel Spiders? If you are like me and scream at the site of a spider crawling up your wall, you might have a hard time biting into one of these gross Halloween treats. However, if like me, you love caramel, you might just not be able to resist. Just like I couldn’t resist grabbing a few boxes of Wilton’s new black colored Caramel Dip while shopping at Michael’s the other day. I stood in the store pondering the possibilities of this deep dark candy. I wondered if I could somehow use it in place or corn syrup to make something like modeling chocolate. Modeling chocolate is pliable enough to sculpt or mold into just about any shape, and I love the flavor, but I do have some family members, including my husband, who don’t. They all love caramel, though, so the thought of being able to make caramel modeling chocolate made me very happy. Oh, the things I could do with it. It’s always a very happy day in my kitchen when one of my crazy ideas actually works. The caramel out of the container was a bit firmer than I needed to make the candy, but it was too soft to mold on it’s own. I pushed some of it into the spider mold, froze it, and tried to remove it from the mold. When mixed with a little bit of heavy whipping cream, to thin it out. then with some Black Candy Melts, it made the most amazing tasting caramel modeling chocolate. It worked perfectly in the spider shaped silicone ice cube tray I used to make these candy spiders. Of course spiders come in all sorts of colors. 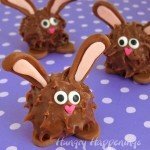 You could use Wilton’s Sea Salt Caramel Dip mixed with semi-sweet or even milk chocolate to make brown spiders. Wilton even has a Butter Rum Caramel Dip which could be mixed with butterscotch chips to make a really light brown spider. I stuck with black, but can’t wait to try the other flavors, as well. This recipe is super simple. Three ingredients are all you need to create your own black caramel candy spiders. However, you MUST follow the instructions exactly. Just like when making modeling chocolate, temperature matters. If the caramel or candy coating is too hot, the oils will come to the surface, and you will end up with a greasy mess. If that does happen to you, then go to my Chocolate Making Tips page and find my tutorial on How to Fix Greasy Modeling Chocolate, and follow those instructions to fix your candy. I made three batches of this, and on my first experiment, I didn’t cool the caramel enough so my candy was greasy. I was able to fix it with a little patience and work, and know you will be able to fix yours too. 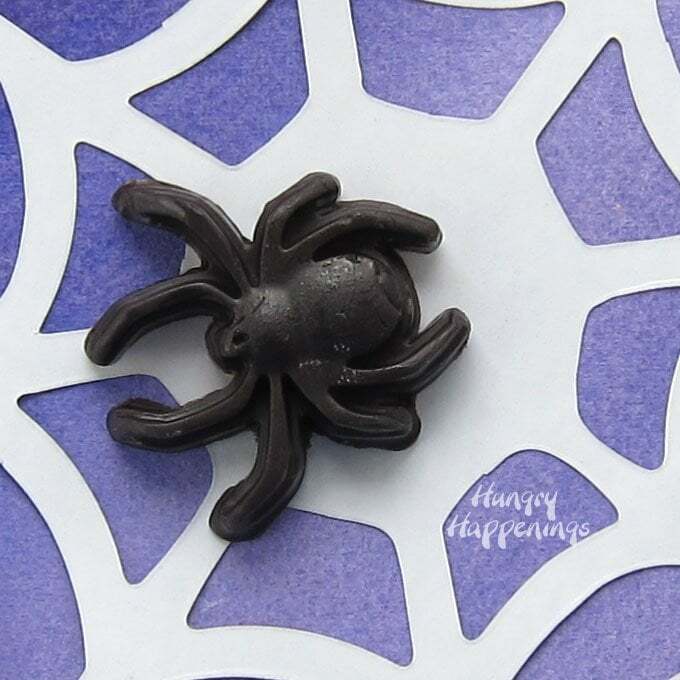 Black colored caramel modeling chocolate used to make spiders for Halloween. Open the box of caramel dip and remove the plastic covering. Heat in the microwave on high power for 45 seconds. Carefully stir in the heavy whipping cream. Allow to cool until it's cool to the touch, stirring often. 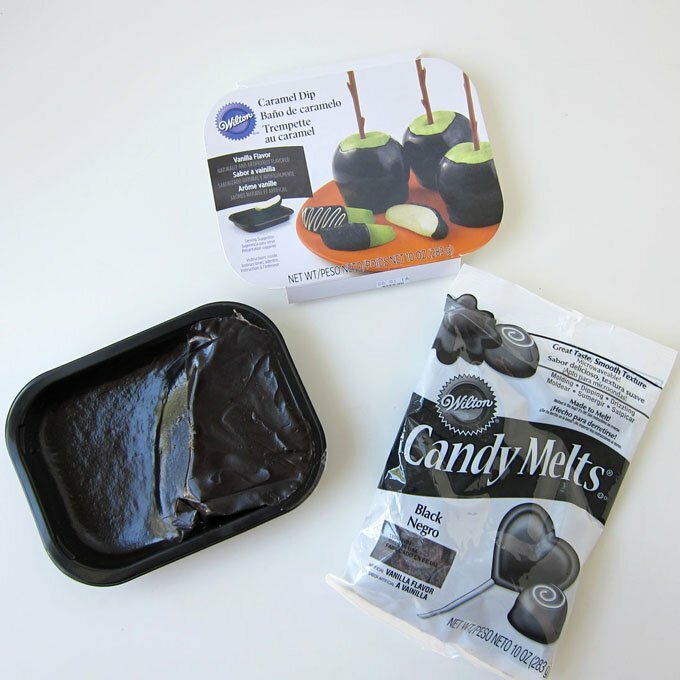 Pour the candy melts into a microwave safe bowl. Heat for 45 seconds, then stir. Heat for 15 seconds, then let sit in microwave for 3 minutes. If you need to, heat for 10 second increments, stirring after each until melted. Allow the candy melts to cool to 91 degrees Fahrenheit, stirring the bowl often to make sure the candy around the edge of the bowl does not harden. You need to keep the candy fluid. Once it reaches 91 degrees, pour in the caramel, and stir slowly until well blended. Let it sit in the bowl for 10 minutes. Then, pour it out onto a cool surface, like marble, granite, or the back of a cookie sheet. Knead until smooth and pliable. 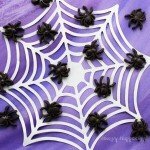 Press into silicone spider molds or candy molds to create fun Halloween treats. Freeze for 10-15 minutes, until very firm, then remove and press candy out of the mold. You’ll need a thermometer to test the temperature of your candy melts. I use a Thermapen instant read thermometer. I love how quickly this thermometer responds to changes in temperature. The Black Caramel Dip is available at Michael’s craft stores. 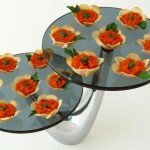 As a brand ambassador for Wilton, I am compensated for creating projects using their products. If you just can’t handle eating a caramel spider, how about making Halloween lollipops. You can use any plastic or silicone candy mold to shape this amazing caramel candy. 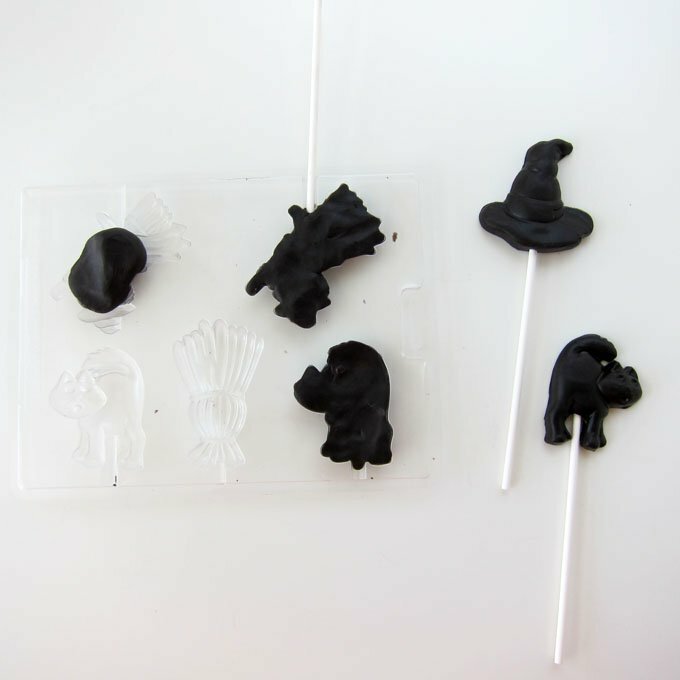 For our witch themed Halloween party I made black caramel witch hats and black caramel cat lollipops. I was so happy to find that inserting a stick into the caramel modeling chocolate was not only easy, but it held firmly. I put a lollipop in a cake pops stand and allowed it to stand upright overnight and the lollipop held it’s shape perfectly. Of course, you might have issues if your house is extremely warm, but that would be the case with chocolate pops too. 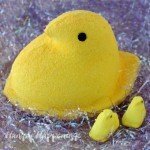 To use a plastic candy mold, just press the candy in, pop it in the freezer for 10-15 minutes, remove and invert the mold, and press on the back side of the mold, allowing the candy to pop out. I’ll be serving both the lollipops and these spiders at our party. That way my party guests can choose which they would rather eat. Can you handle eating a Black Caramel Spider? 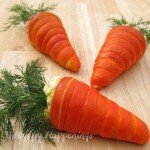 How about these other gross Halloween treats? I bet you are thinking those black caramel spiders aren’t so bad after all. Beth, Thanks for the GREAT tutorial!! I purchased the same spider silicone mold last weekend at the Dollar Store and was going to make plain black spiders to top cupcakes. These Black Caramel spiders sound so much better!!! I’m going to Michael’s now to buy the Wilton carmel. You are so welcome, Karen. I just picked up a few more molds at the Dollar Tree this week too. I only had one and have another project I’ll be sharing soon using the mold again, this time with the spider webs. Have fun making your spiders and creeping out your friends. These are creepy for sure…sooo real looking! You know, I had no idea Wilton had caramel dips..where have I been?! I can’t wait to go to Michael’s today! Your spiders look scary good! Wilton came out with traditional caramel dip last year, but the black is new this year and is only available at Michael’s. 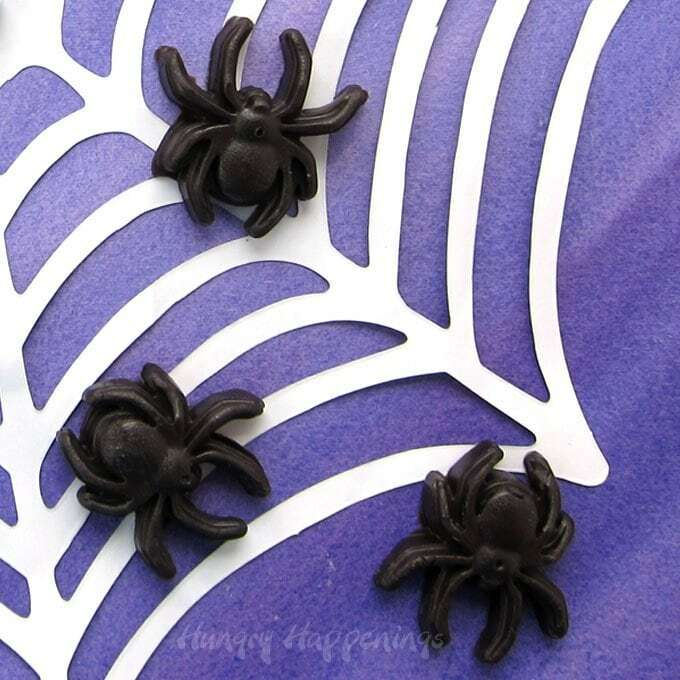 It has a really nice caramel flavor and when paired with the black candy melts makes the perfect realistic looking spiders. I’m glad you like them! Thanks, Karen. I also bought a mold from the dollar store after i seen this, going to check out micheals friday. Kids are excited as well to try this. 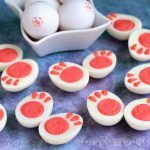 These were a huge hit at our Halloween party. Everyone was so surprised when they bit into the candy to find it was caramel. I am wondering what is the best way to store these? I stored them in a Rubbermaid container. They stayed fresh for well over a week. 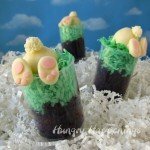 So I saw this recipe and then was really sad when I found out that Wilton doesn’t make the black caramel anymore, but I used the regular caramel packet, thinking it would just make a dark brown with the black candy melts. Then I ended up buying some black food coloring paste at Walmart (just in case), which I was really glad of, because the candy melts turned out purple instead of black once melted, but the black food coloring worked great, and it all turned out perfect! I had to use the How to Fix Greasy Modeling Chocolate link (which, by the way, site owner, is not at the link you posted—I had to click through about 4 other pages to find it, which was annoying, but I eventually did find it, and it was helpful), since I think I stirred too fast to mix the caramel and chocolate. I also found that I really couldn’t use my fingers to press the candy into the molds because it would warm up again and get oily and not set properly, but once I got the hang of it (used a regular dinner spoon), it worked really well. It’s always so disappointing when a product is discontinued. I loved the Wilton black caramel and am sad that it’s gone from store shelves. Sorry about the link to the the greasy modeling chocolate tutorial. 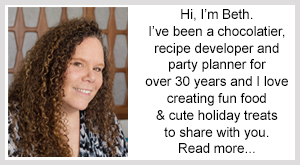 I used to only have one page with all the information about chocolate and modeling chocolate and as the page has grown as I’ve added so much more detailed information, I split it into several pages. I have not had time to go back through older posts to change all those links. I am so sorry! I am so happy to hear the spiders did eventually work for you and I hope you enjoyed them!